October is a common month for educational institutions of all sizes and types to hold reunion and homecoming weekends. In fact, this October I attended my own 20th year class reunion weekend at Northwestern University. Most institutions have reunion giving programs, some more formalized than others. A lot of the activity takes place prior to the reunion weekend (often in order to make a big-splash announcement with a ceremonial check). But what are you doing afterwards to secure more gifts from alumni who attended the various reunion weekend activities? Too often, educational institutions do not leverage event attendance information for fundraising purposes. 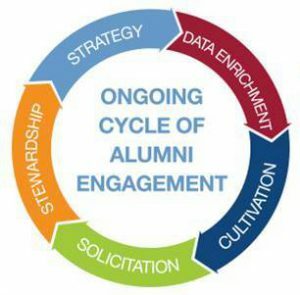 In today’s multichannel world, having and utilizing this knowledge for every aspect of the alumni experience can make a significant difference for fundraising. These types of personalized communications based on reunion weekend sessions attended are the same levels of personalization commonly found in successful business today. According to recent consumer research from the Aberdeen Group, businesses that personalize their shopper’s interactions see a 15.1 percent improvement in annual company revenue and a 19.4 percent improvement in a customer’s lifetime value. If an alumnus attended a specific faculty speech or panel at reunion weekend, use those topics in upcoming communications. Did they attend a reception? Concert? Class party? Football game or other sports event? The alum has self-identified their interest in at least one topic through their attendance. Take advantage of this knowledge and tap into your share of that 15.1 percent increase in annual revenue via personalization. Try to utilize your advancement database as a true CRM tool rather than just a place to house gift transactions. In order to not only leverage reunion weekend activities for increased gifts, but also to measure some effectiveness of messaging, segment your attendees into their own short-term audience pools. Some institutions simply refer to these as “sub-segments” or similar terminology. By doing so, you can immediately contact these attendees via any channel, especially via your telefund operation. Think about the impact of having a current student speak to a reunion weekend attendee not long after a special weekend for any alum coming back to campus. This can also be viewed as a targeted sub-segment of your reunion giving pools. But instead of targeting everyone based on a graduation year, now you’re able to drill down even more into your data and reach an audience that has self-identified their excitement about your institution by virtue of their reunion weekend attendance. Within these short-term pools, be sure to personalize based on the donor’s giving history. As with any other fundraising message, don’t just send the same thing to lybunts vs. nevers or leadership vs. low-dollar donors. For some recent donors, this could be a tremendous opportunity to solicit for membership in your leadership giving societies. These short-term reunion attendee pools should run at least through the critical calendar year-end giving period. You can implement as many CYE strategies as desired for these groups. Extending these pools into January-February 2016 is also an option. Every person who attended your October reunion weekend activities is either a current donor, lapsed donor or prospective new donor. With November and December representing the biggest charitable giving time on the calendar, set a positive tone by doing at least one cultivation activity before the calendar year-end giving season truly gets underway. Send out something that truly reflects the weekend’s activities. Maybe you have a couple of videos that can be emailed. Maybe you have an online photo gallery. Maybe you can offer a free photo download or two from that gallery. Maybe your campus bookstore can offer a discount on campus-branded items purchased online in time for the holidays. Simply put: do something unique and special for attendees before you start soliciting harder in the weeks leading up to December 31. Additionally, don’t limit your cultivation to alumni. Include all attendees in the mix — spouses, friends, parents, faculty and so forth. If your institution asked attendees to register for specific sessions, consider sending a note to those attendees from a speaker, panelist or featured host. This will add yet another personalized element to the attendee’s experience. These thank you messages can be distributed via mail, email, or even a broadcast voice messaging system. For some donors, a handwritten note would be more appropriate depending on their relationship with the institution. These are not necessarily always larger donors, but these could be longer-term loyal donors or donors you’re actively cultivating for significant upgrades as well as planned gifts. No special event, regardless of size, ever gets through without a glitch or two. And don’t assume your viewpoint of the event is shared by your audience. Survey your reunion weekend attendees and find out for certain. Don’t just ask about sessions. Ask about their overall interactions with the institution. Just as important for fundraisers, ask questions that can be turned into actionable results to directly impact the number and amount of gifts. If attendees wore a donor sticker on their nametag, did a staff member or session host make a point of directly thanking the attendee? 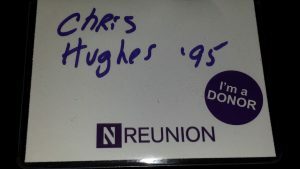 At my college reunion, my nametag had a sticker mentioning that I am a donor, a good practice for any reunion event. What events did they attend and was there a correlation between the degrees of satisfaction from reunion weekend? Was the attendee experience different for those who live near campus compared to those a longer distance? Be prepared to not only analyze responses based on class years and donor variables (current, lybunt, lapsed, etc…), but also look at responses based on things like geography. As with any survey, don’t ask for input and then not implement findings. With reunions, that implementation can be trickier because you don’t necessarily want attendees to wait five years to see the positive impacts of their feedback. Reunion weekends require involvement, coordination and cooperation from every aspect of campus. Development offices often end up shouldering a heavy load of expectation beyond event attendance, yet may have minimal influence on the quality of the attendee experience. This could be everything from the check-in process to signage to the alumni group’s seating location at the homecoming weekend football game. All of those and much more can influence how a donor responds on a forthcoming calendar year end solicitation. Don’t stop the flow of internal cooperation once the weekend’s activities conclude. Get every bit of data and feedback possible in order to address issues and interests in a way that generates new, additional and upgraded gifts via a personalized, enhanced case for giving. Remember, the steps of the donor cycle include cultivation and stewardship, not just solicitation. Using all of those steps between now and December 31 should mean improved results for your fundraising program. Got a great reunion strategy? Drop a note in the comments below or send me an email. I’d love to hear about it.